For purposes of self-auditing and identifying times when I may not be reasoning in a completely reliable manner, I maintain a taxonomy of reasoning modes along with clearly identified ways they could be used incorrectly. Since this may conceivably be helpful to others, I present it here. Linear Reasoning. A conclusion (C) follows directly or nearly so from a proposition (P). The validity of the conclusion rests on the validity of the proposition and the evidence for it. The linear relationship is itself testable empirically and auditable mathematically or logically, and therefore conclusive if demonstrated. Lack of evidence for the proposition or even evidence against the proposition argues somewhat against the conclusion, but cannot rule out the conclusion being correct and reachable by some other means. However evidence against the conclusion is strongly disqualifying of the proposition (known as Transposition in logic - if P implies C, then no C implies no P), and in cases of a very well supported proposition, it argues against the logical relationship itself. A faulty relationship (i.e. a logical error or fallacy) alone also does not rule out either the proposition or the conclusion, since they may still be able to be connected by some other less fallacious process. Parabolic Reasoning or reasoning by analogy. This is a fundamentally unreliable form of reasoning and is never conclusive, but can be useful for purposes of communicating otherwise reliable results or anticipating results yet to be established. The process is to draw a parallel between a (presumably) established line connecting an established proposition and its conclusion (P1 -> C1), and using that to propose or argue (weakly) for a similar relationship between some other proposition and the new target conclusion (P2 -> C2). Similarity in no way guarantees that such a relationship exists, but where Linear Reasoning has independently demonstrated the relationship and where the proposition is supported by evidence, parabolic reasoning can become a shorthand for introducing others to the result. Hyperbolic Reasoning. If Parabolic Reasoning is unreliable, then Hyperbolic Reasoning is even less so. An analogy to an established proposition-conclusion relation is not only made but stretched and compounded (P2 -> -> C2). While the modified parallel relationship is even less assured and a conclusion thus reached is even more speculative, hyperbolic reasoning (as with parabolic) may be a discursive tool and further may be useful in producing hypothetical relationships or propositions that may warrant empirical investigation. This may be necessary for example when there is some evidence to suggest a conclusion, and an explanation for that conclusion is being sought. Parabolic and Hyperbolic Reasoning may thus be a means of generating candidate explanations. Generally, however, when a line connecting a proposition to a conclusion is found to be not only a mere parallel to an established relationship but a distended, stretched, and modified version of that relationship, the conclusion as well as its line of reasoning must be regarded with even greater skepticism. Circular Reasoning. A proposition can sometimes also be reached by way of linear reasoning from its own conclusion in a process that is more than just the converse of the original P -> C reasoning, i.e. P -1> C -2> P. If either statement are supported by evidence other than each other, then this is not necessarily wrong and is in fact fairly common. Note that only valid linear reasoning in both directions results in a true (as opposed to apparent) circular reasoning loop. Even if each point is the only evidence offered in support of the other, a circular reasoning loop may not necessarily be wrong, because the evidence may not yet have been found that supports one or the other propositions. However, contrary evidence for either is evidence against both, which is critically unlike the case with Linear Reasoning. Normally, evidence against a proposition does not negate a conclusion because there may be other unknown ways for that conclusion to be valid. But evidence against a conclusion reached by a valid linear process from a proposition directly negates that proposition. In circular reasoning, both statements are simultaneously propositions and necessary conclusions, and therefore evidence against either is evidence against both. Elliptical Reasoning. A conclusion can loop back on itself as in Circular Reasoning, but by way of at least one additional statement or conclusion. Elliptical Reasoning loops are typically only in one direction because the arguments are not just the converse (reversed) argument of each step. As before, each argument linking a conclusion to a proposition must be a valid logical step for which empirical evidence and auditable logic exists. Evidence for the propositions themselves again plays a similar role, either by supporting the entire loop or negating the entire loop, and for the same reasons given above. Spiral Reasoning. Relevant mainly to Applied Science (Engineering) is the concept of iterative or spiral reasoning, in which the starting proposition in an Elliptical Reasoning sequence is known to be plausible but inaccurate. That means it is the kind of thing that could be true, but is not necessarily quantitatively true. Some people say "qualitatively" true, but this lacks precision. To be precise, P is "dimensionally" true i.e. has the correct dimensions representing the physical quantity under investigation. For example, the proposition may be, "the flow rate is 14 litres per second." It is highly unlikely that the flow rate is actually 14.0000000 l/s, but the flow rate must be some number of litres per second, and might in fact be within an order of magnitude or two of this value. That makes the statement plausible if technically inaccurate. From that starting P the chain of reasoning is followed, e.g. "if the flow is 14 l/s then the system pressure must be x Pascals." Real examples may involve several further steps, but at some point the conclusion from the latest proposition will be that the flow rate must be some value 'P' litres per second. This is recognized as not just the same kind of statement made in the first plausible but inaccurate proposition, but as a (hopefully) more accurate re-statement of that very same proposition. Thus the loop is at the same time both closed and slightly shifted in position. 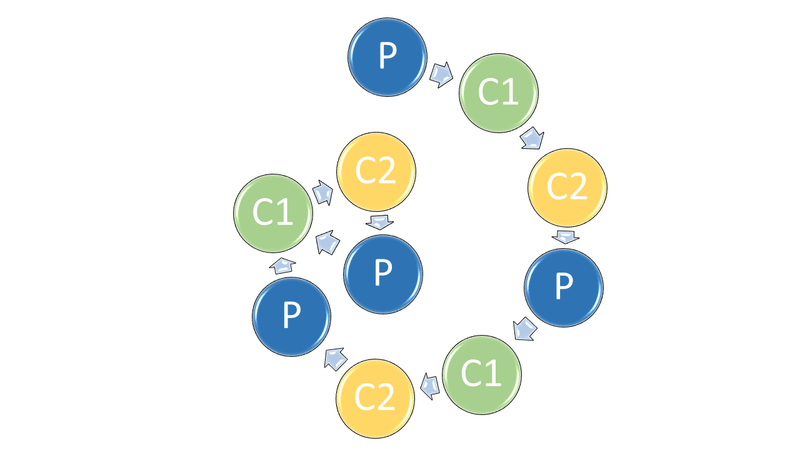 This process is iterated until P no longer changes in value and the elliptical reasoning loop represents an entirely self-consistent chain of reasoning. At that point, any empirical evidence supporting any one point in the chain supports the entire chain as valid. Multiple points of empirical evidence support not only the statements but the reasoning connecting them; in other words we then know the formulas are substantially true as well as the numbers. The relationships between logical reasoning, logical fallacies, positive evidence, and negative evidence are hopefully more clear. When one can at least identify the category of an argument in this simplified taxonomy, one can more readily evaluate the soundness of the argument and when necessary identify and correct errors. When a logical step is sound, auditable, and even empirically-based, evidence in favour of a proposition may be reliably taken as evidence for a conclusion, and evidence against a conclusion as evidence against the proposition. A typical Scientific Method (there is not just one Scientific Method but endless variants) begins not with a proposition but with a conclusion that is closely linked to an observation. An explanation is sought for this observation. It is hypothesized that the observation O is a manifestation of conclusion C, and C follows causally from proposition P by way of a proposed mechanism. Empirical evidence is then sought in support of these previously unanticipated predictions, being P and the mechanism for P -> C. Finally, direct evidence for C is sought, as is confirmation that C produces the observed effect O. This is a completely valid, reliable, and logically sound scientific process, provided it can be replicated independently. Another version of Scientific Method proceeds in the opposite direction: proposition P is asserted leading to the conclusion C; evidence for C is observed, and therefore P is accepted - or is it? This is completely wrong, of course, because evidence for C does not prove P. One looks instead for falsification of C,or evidence against C in order to confidently reject P. This is also a reliable and valid scientific process, and has the advantage of being less vulnerable to confirmation biases.